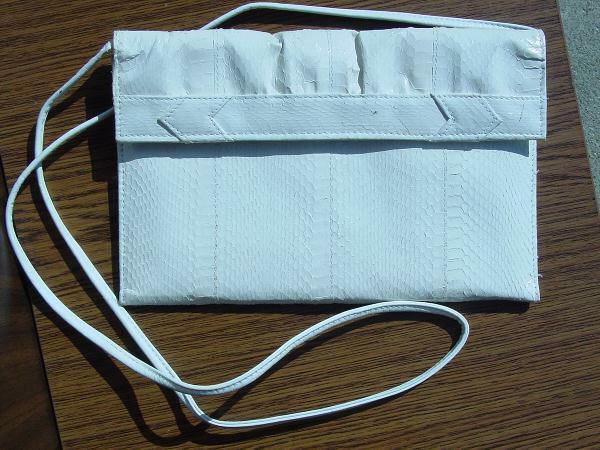 This white snakeskin purse has a front flap closure with a magnetic snap. The black spot on the flap between the two arrows was a little flying black bug that got into the picture - it's not on the purse. The reddish mark to the right of the arrow is lipliner. You could untie or tuck in the 50" shoulder strap and carry it as a clutch. It belonged to an Italian model, who put her initials in black in the inside upper left hand corner of the flap.